Somehow I feel ritzy, elite, just writing the name. 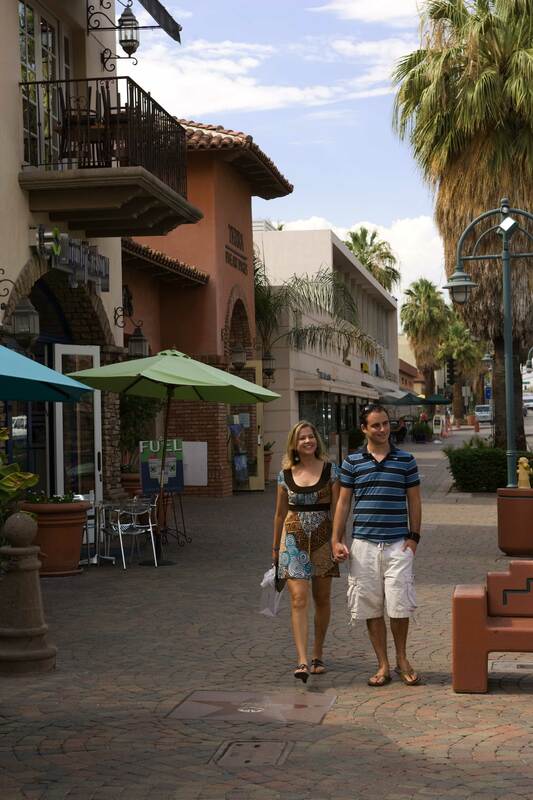 This California desert town of 48,000 or so people ranks with places such as Malibu and Beverly Hills in the L.A. area, Greenwich in Connecticut, Georgetown in Washington, D.C., Long Island’s “Gold Coast,” and another “Palm” — the one followed by “Beach” in Florida — among the nation’s aristocratic addresses. But Palm Springs stands alone in one category: it is considered the “Mecca of Modernism” — the most concentrated collection of mid-twentieth century modern architecture on earth. 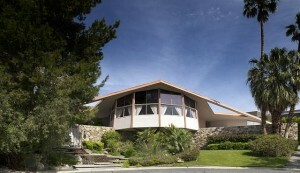 “Desert Modernism,” the style is sometimes called. 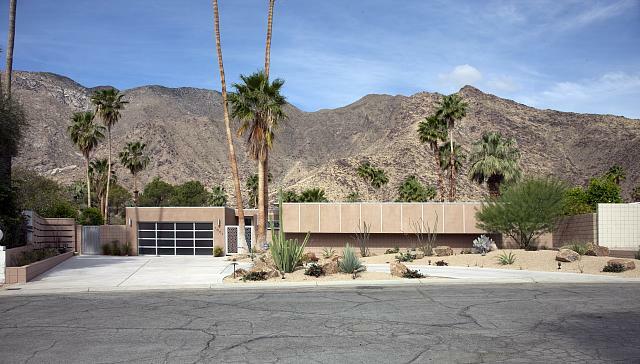 It saved Palm Springs from the relentless onslaught of faux-Spanish, red-tiled houses that overtook much of the rest of Southern California. To be fair, I know about as much about architecture as I do about, oh, Etruscan pottery. I couldn’t tell a finial from a newel post. And as you know if you’ve been with me for awhile, Carol’s and my tastes run toward cozy Victorian, not angular modernist. 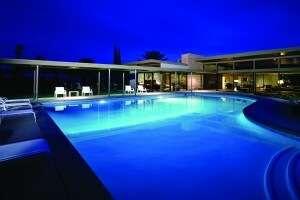 But I respect what I read about Palm Springs’s ambitious architecture. I know what Carol and I saw: more glass walls and long, low roofs — and decadent swimming pools — than we’d ever seen in one place. And I know what Robert Imber told us. And the perfect place to build unorthodox places in which to frolic. Before I wade — quite possibly over my head — into more design talk, let’s consider the historical and physical backdrop. 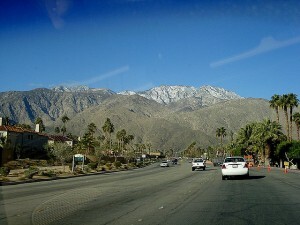 Palm Springs basks in the Coachella Valley desert, 177 km (111 miles) east of Los Angeles. 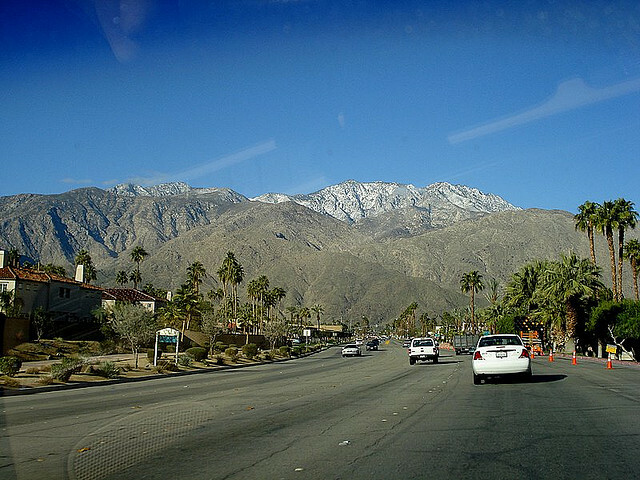 Good-sized mountain ranges to the west, south, and north knock down almost every storm that would dare to move far inland off the Pacific Ocean, leaving Palm Springs warm and nearly bone dry. 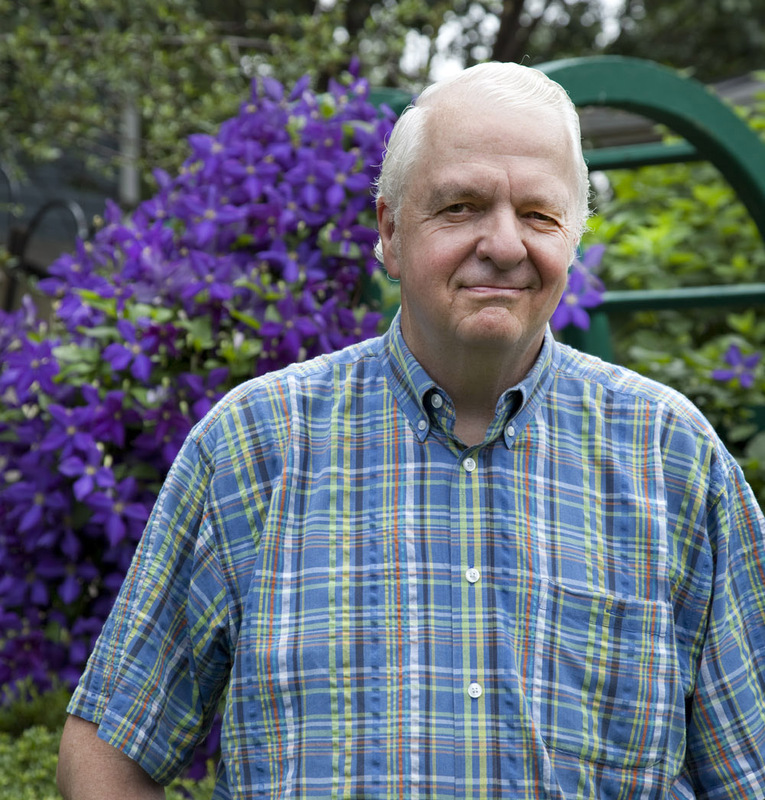 Only 15 centimeters (6 inches) of rain a year somehow fall, and all but 11 days annually, on average, are sunny. Did I say warm? Make that roasting hot of a summer’s day — routinely 40 C° (105 F°) or hotter. It is that “dry heat” of which asthmatics and cactus lovers speak so fondly. But with nary a cloud in the sky to hold in the warmth, temperatures at night — even in the summertime — can plummet all the way to the low 20s C° (70s F°). Winter nights are nippy, but come spring and fall, temps are splendid. 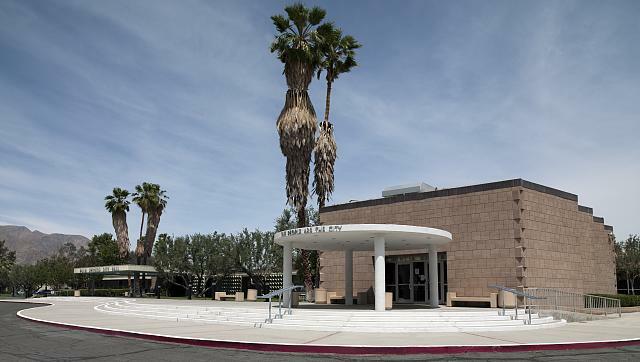 There’s more groundwater in this area than in forlorn California desert spots such as Death Valley — enough of an oasis to have attracted a tribe of Cahuilla Indians called the Agua Caliente half a millennium ago. Their name in English — “Hot Water” — suggests that we’re not talking icy brooks, however. The Spanish and, later, Mexicans who controlled California until 1850 took no lasting interest in the place. But eventually wealthy Anglos from the humid, chilly California coast began to see its potential as a winter retreat. The oldest remaining building in Palm Springs — a simple adobe built in 1884 for the first permanent white settler, San Francisco attorney John Guthrie McCallum — still stands. I’d bet just about anything that you’ve never heard of McCallum. But I’ll bet you know of some of the producers and stars who turned Palm Springs into “Hollywood’s Hideaway” in the century that followed. They included Howard Hughes, Lucille Ball, William Holden, Elizabeth Taylor, Steve McQueen, and three members of the mischievous “Rat Pack” — Frank Sinatra, Dean Martin, and Sammy Davis, Jr. Longtime residents Bob Hope and his wife, Delores, founded golf’s premier celebrity tournament there. Sonny Bono — the male half of singing Sonny and Cher, who was Palm Springs’s mayor from 1988 to 1992 — helped organize the highly regarded Palm Springs International Film Festival. And Albert Einstein, who generally steered clear of cameras, and legendary “Singing Cowboy” Gene Autry — an astute businessman who bought a hotel in town — lived in Palm Springs some, too. Not anything frou-frou, I would remind you. 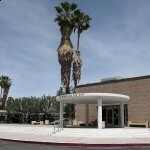 Stark, protruding, even cantilevered Desert Modern, where structure and unconventional form trump neoclassical frills. Inspired by the aesthetics of the German Bauhaus — I’m straying past my comfort zone here — architects such as Albert Frey, who had studied with famed urban designer Le Courbusier in Paris, designed Palm Springs’s city hall, the airport terminal, and the aptly-titled Movie Colony Hotel. Frey and others placed boulders, water features, and mountain backdrops into the hearts of their designs. They expected that sunset tableaus would be enjoyed to the fullest over drinks, right from the living room. George and Robert Alexander, a father-son, Los Angeles-based developer team, delivered the dream of the stylish good life to the masses. Or if not the masses, the crust below the upper one. They created highly functional, low-slung, relatively affordable tracts of houses out of all kinds of materials, such as concrete, that had theretofore been anything but fashionable. “Tiki-martini,” some wag described the Alexanders’ style. 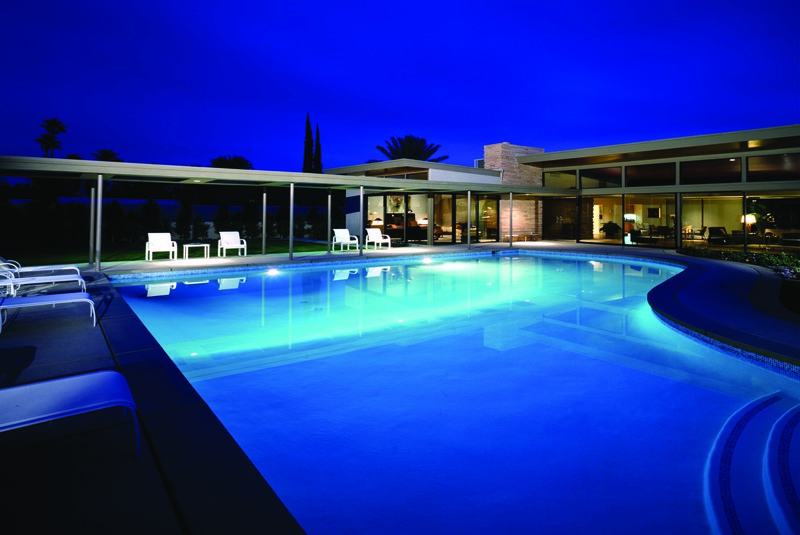 The house, now the most-visited and -photographed spot in Palm Springs, is the venue for “Elvis birthday celebrations” and “Elvis Honeymoon Weekend poolside concerts” that draw quite a throng. People were lined up in the heat outside the day Carol and I got a tour. There is much more daring work around, however. In 1936 — two years before Palm Springs would be incorporated as a city, Los Angeles architects Adrian Wilson and Eric Webster designed a “streamline moderne” hillside house that became known as “The Ship of the Desert.” Later destroyed in a fire, it was faithfully restored by its owners. In 1963, Albert Frey designed what today is one of the most famous gas stations in the nation. 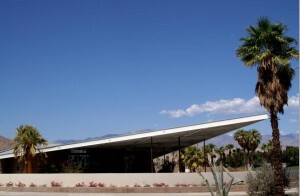 The Tram Way gas station, featuring a long, flat, angled roof that gives the place the look of a trapdoor opened slightly, is now the city’s visitor center. Seems that he likes it. There was a lot of “floating” going on in Palm Springs, apparently, and not just in the pool. 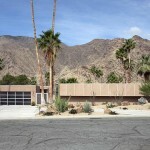 Thanks in part to the Alexanders, people of fairly ordinary means — especially retirees — moved into Palm Springs in the late 1970s and beyond. They turned the town from what Robert Imber has called a “sleepy seasonal village for affluent snowbirds” into a vibrant community in which businesses and hotels that were once shut tight each July and August stay open all summer. 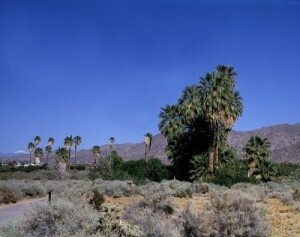 It may not be the “Palm of God’s Hand,” but sun-kissed Palm Springs is no hideaway any more, either. Ingénue. A naïve, innocent girl or young woman — especially an actress who plays one.